Here at Certified Autoplex in Carrollton TX, just outside of Dallas, we want to help you with every single step of finding your next car, including what is definitely one of the most vital parts: researching possible vehicle options. We highlight as many available vehicles in our inventory as we can, to help you make sure you get the exact features you want in a vehicle at your ideal price. Here, we will be providing details on the Ford Explorer midsize SUV. Ford has long been one of the most reliable American-made car brands, and the Ford Explorer is no different. When it comes to power, comfort and cargo, the Explorer is one of the most impressive vehicles in its class. Let's take a look at our available models of the Ford Explorer, and the features that make up this SUV. 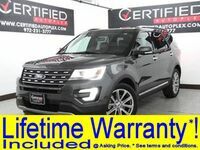 If you are in the Carrollton TX or Dallas TX area and are already considering a used Ford Explorer, follow this link to our inventory of the vehicle. 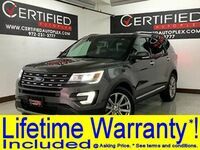 We currently have two available models of the Ford Explorer, both of which are from 2017, and are the limited trim level. In terms of the vehicle's performance, the Ford Explorer has exactly what you want from an SUV. The 3.5L V6 engine in the Ford Explorer can generate up to a whopping 290 horsepower and 310 lb-ft of torque. With this much power, it is no surprise it can tow up to 2,000 pounds. Additionally, the Tiptronic automatic transmission, electronic stability system, braking assist and more also give it excellent handling. The Ford Explorer is also a fantastic vehicle for those looking for a lot of space, both in terms of seating and cargo. When it comes to seating, the Ford Explorer can comfortably fit up to seven passengers, including 43" of front legroom and 40" of rear legroom. When it comes to cargo, the Ford Explorer has a maximum luggage volume of 80 cubic feet, including 21 cubic feet with all the seats up, which is great for moving or family road trips. Finally, one of the most important qualities that make it a great family vehicle is how safe of a vehicle it is. In terms of mechanical safety features, it has side-impact, side0curtain and knee protection airbags that all help minimize damage in the event of an accident. Additionally, the available features of lane-departure warning, blind-spot monitoring and forward collision warning work to prevent as many accidents as possible.